To play, click on a paving block and then on an empty cell to move it. 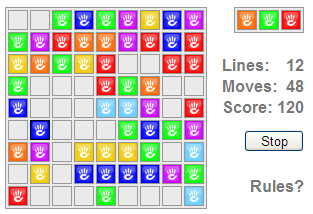 Create matching lines to score and prevent the grid from filling. Every time you move, more paving blocks are added. The game ends when there are no free cells. Provides one C5 block for the game and a second C5 block to show the scores. Many game parameters and score display parameters are configurable through the respective edit interfaces. Having fun with Concrete Paving? Try playing Concrete Bricks. Have a play with ConcretePaving and your score could be entered on the right. Lines: 0. Moves: Score: Last updated: over a year ago.... more.